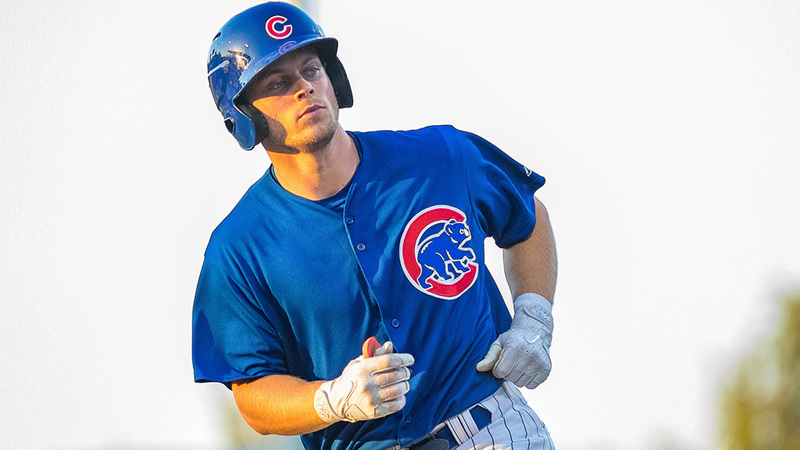 The offensive potential has been slow to materialize for the Cubs' top prospect so far, but the 20-year-old has remained a standout prospect because of his talent behind the plate. Although Amaya has seen some time at first base throughout his career, he's been praised for his pitch framing, blocking and receiving while possessing more athleticism than the typical catcher. "I think he has certain intangibles that you look for behind the plate," Cubs' director of international pro scouting and player development Alex Suarez told the Associated Press last week. "He's a great teammate, and he's taught himself English. He's pushed himself to be able to communicate with the English-speaking and Spanish-speaking players. "When it's all said and done, the tools behind the plate and at the plate have proven that he belongs in pro ball, and he's somebody who we should definitely keep our eyes on." The native of Chitre, Panama, threw out 46 of 135 base-stealers (34.07 percent) and committed nine errors as a backstop last season. At the plate, he batted .256/.349/.403 with 12 homers, 21 doubles, three triples and 52 RBIs in 116 games with Class A South Bend. The argument can be made that Amaya is the jewel of this system, but the second-ranked Hoerner gained an edge with his tremendous production in the Arizona Fall League and brief time in big league Spring Training. The 21-year-old climbed to South Bend less than two months after being selected with the No. 24 overall pick last June and finished the regular season batting .327 with a 1.021 OPS in 14 games. MLB.com's No. 100 overall prospect followed with a .337/.362/.506 slash line, nine extra-base hits and 11 RBIs in the AFL and proved to be a tough out this spring. "Nico is awesome," Cubs farm director Jaron Madison told MLB.com. "I think the most impressive thing about him is the kid -- the makeup and the person he is. He's a team guy, a leader, and he connects really well with his teammates. You don't normally get that from guys who go in the first round." The rapid and enormous success from college hitters like Kris Bryant, Ian Happ and Kyle Schwarber should show that Hoerner, a Stanford product, is in good hands in his development. While he may not show the same power as that trio, he likely possesses the defensive skills to stick at shortstop. "We've done some work with changing his arm stroke a little bit," said Madison. "His arm slot was a little low, especially when turning double plays, so just working to get him on top of the ball more consistently so that he's throwing it with more backspin. "He's figured that out and is throwing the ball really well. It's coming out of his hand a lot better to first base." The 24-year-old reliever was on the precipice of making The Show last season but topped out at Triple-A Iowa with a 1.44 ERA in 25 appearances spanning 31 1/3 innings. Ranked as the No. 24 Cubs prospect, Mekkes opened the year with Double-A Tennessee and quickly jumped to the Pacific Coast League after posting an 0.81 ERA in 22 1/3 innings. The eye-popping ERA numbers are emblematic of the Michigan State product's professional career thus far, as he owns a 1.16 mark over 147 innings in three seasons in the Minors. Listed at 6-foot-7 and 250 pounds, Mekkes doesn't have the intimidating arsenal to match his frame but gets by with low-90s fastball thanks to a deceptive delivery and tremendous extension. His fastball is his most effective weapon, but he also possesses a slider and a changeup that have proven useful. While the 2019 season should bring about the full-season debuts of 2018 Draft picks like Hoerner and outfielders Cole Roederer and Brennen Davis, the club's third-ranked prospect is set for his first April baseball in his fourth professional season. The 20-year-old Dominican native debuted stateside last year with a 1-4 record, 3.13 ERA and 59 strikeouts over 54 1/3 innings between Class A Short Season Eugene and South Bend. Signed for $600,000 in 2015, the 6-foot-4 Marquez is already hitting the mid-90s consistently with his fastball and, at times, coming closer to triple digits. He's one of the harder-throwing lefties in the Minors but often struggles with command of his fastball and secondary pitches, despite a respectable walk rate (2.63). "He was sitting 95-96 mph the other day in his live batting practice," Madison told MLB.com. "He's a big, tall, lanky kid who's still growing into his frame and understanding how everything works and repeats, so there's definitely more in the tank. He'll show you 98s, with the ability to spin a breaking ball and throw a good changeup, but now it's just about him learning to repeat his delivery enough to have command." The Cubs' fourth-ranked prospect was limited to just eight starts in 2018 with a lat injury that shut him down in May. Alzolay reached Triple-A for the first time last season, going 2-4 with a 4.76 ERA and 27 strikeouts over 39 2/3 innings. The injury came at an unfortunate time for the six-foot, 190-pounder, putting an early end to four perfect innings against New Orleans on May 29. "The first couple weeks [after the injury], it was kind of hard at first, just being here in Arizona [away from most everybody else]," Alzolay told NBC Sports Chicago at the team's Spring Training facility in Mesa, Arizona. "But after that, my focus was just getting back to the field to be healthy again. I spent the whole offseason watching video for the teams that we play against in the big leagues. I just watched all those hitters, what they hit in different counts. "I've been learning a lot. Different types of counts, the pitches and all that I can throw against those hitters in different situations." While the lat is fully healed, the 24-year-old Venezuela native has been bugged by a minor back injury that has limited his time in camp. When he's on the mound, Alzolay boasts three plus pitches in his fastball, curve and changeup. More to keep an eye on: Roederer and Davis are two high school outfielders that the Cubs snagged in the early rounds last season. Roederer has been praised for all five tools, most particularly his bat-to-ball skills. Davis is a speedster and a 6-foot-4 high school basketball star who batted .298 with six stolen bases in the Rookie-level Arizona League. ... Reivaj Garcia (his first name is Javier spelled backwards) batted .302 as a 16-year-old in the Arizona League last year. ... Cory Abbott had arguably the best 2018 of any Cubs' Minor League pitcher, sporting a 2.50 ERA over 115 innings with South Bend and Class A Advanced Myrtle Beach. ... Alex Lange, a workhorse since his college days at LSU, pitched to a 3.74 ERA over 120 1/3 innings for the Pelicans last year.